This blog is all about wines of value. However, value is sometimes confused with wines that are cheap or less than a certain dollar amount. Value can be found at all price points. That said, there is an upper limit to how much I'd be willing to pay for the absolute best newly released bottle of wine I can imagine. How much? Let's look to the WWP QPR Calculator for guidance on this. At this point in time, Wine Spectator has rated 173 Napa Cabernet Sauvignons from the 2006 vintage. In 2005, they rated a total of about 500 Napa Cabs, so they've got a ways to go. One wine has jumped out as being extremely highly rated and while expensive, I feel it is an interesting candidate for analysis. According to the Wine Spectator Online database, no domestic wine has ever scored 100 points in one of their blind tastings. Furthermore, only 3 other wines have received 99 points. 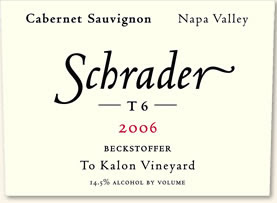 These Schrader wines are effectively the best Napa Cabs the magazine has ever rated. Let's focus on the $125 T6 Cabernet. $125 may seem like a ridiculous amount of money to pay for a 750ml bottle of wine, and it is, but relative to other outstanding Napa Cabs it's really not that expensive. If you look back at the 2005 vintage, and look for the wines that are rated 90 points and above (Spectator's cut off for "outstanding") it looks like at around $45 you can find a 90+ point Napa Cab fairly easily. Brands like Buehler, Honig, Snowden and Cliff Lede are produced at high enough levels that they're readily available across the country. This defines the baseline for comparison that drives the WWP QPR Calculator. Let's extend this a little further to see what the fair value for a 100 point Napa Cab would theoretically be. If we keep the baseline price at $45, change the quality of the wine to 100 points, and start adjusting the price until the wwpQPR is 1 we see that the $445 is the price at which the calculator indicates that the wine is of average value. Would I buy pay $445 for a bottle of wine for enjoyment purposes? Heck no! I try to buy wines only if they're a very good value. Would I pay $150? I probably would. That would yield a wwpQPR of over 3.0- a very good value. But that's about as high as I could go. That's about the most I could justify in my mind. How about you? There were only 250 cases produced of this wine. It's sold almost entirely through their mailing list and I've never seen it in a store. You might be able to find it online from a rare wine dealer or through an auction, but the price would surely be closer to $300. This scenario makes it tempting to join the Schrader mailing list and take your chances on the 2007 vintage. Say we think the T6 is again going to be a winner in 2007, and we were able to buy a bottle for $125. Then, the ratings come out and this time it "only" receives 95 points -or- when we drink it we think it's "outstanding" but not "a classic" and we'd give it roughly 95 points ourselves. How good a value would it be then? Going back to the WWP QPR Calculator, we see a wwpQPR of 1.14: Above Average reported. It's still a decent value, but it's barely above average (1.0 being the average for the calculator). At that point, I'd definitely not buy it at $125. Combine this risk with the difficulties and costs associated with shipping wine to Massachusetts and I'd probably decide against buying wines like this even if I had the opportunity to do so via a mailing list. It's just too much of a hassle and there's too much risk. What do you think? Question of the Day: What do you think of this? What would you pay for the best current release wine you can imagine?